Just because the NHL isn&apos;t playing doesn&apos;t mean you can&apos;t catch some great hockey action, right here in Greater Lansing! Well its early December and typically fans of the NHL are getting a full schedule of ice hockey. Professional games are normally being played almost every night of the week and without fail, if you turn on the TV you can flip a couple channels and see either a hockey game or highlights from last night. Problem is, that&apos;s not the case this year. No, with the NHL owners lock-out going on its likely we&apos;ll miss an entire season of NHL hockey and that has a lot of fans upset. Well the GLSA is here to help you out. That&apos;s right! This is your official GLSA reminder that there is still hockey going on right here in the area. Yes you can still get your fix for on-ice action - and best of all, it&apos;s going on live. From MSU Spartan hockey going on at Munn, to regional and national tournaments happening at Suburban Ice and The Summit. 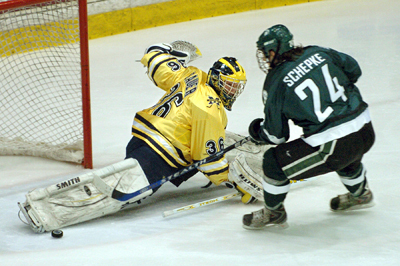 Spartan hockey is a ton of fun and the match-ups are great. Get more information at www.msuspartans.com. Then as far as tournaments, from kids to professional and Olympic hopefuls check back here at www.lansingsports.org for tournament names, times and locations. Sure, someday the NHL will be back and we&apos;ll have the Red Wings taking on the Blackhawks, but for now, die-hard hockey fans have to branch out and I&apos;m here to say you&apos;re going to be happy you did. There&apos;s great hockey going on in the area and just watch yourself become a fan. Game on!